Buy 100% Cotton Large Bullion Bags | ?? 全棉大金银袋 The 100% Cotton Large Bullion Bag is the perfect way to store, not only silver bars but any silver bullion as well. These sturdy canvas bags are not only a throw back to the days of banks holding physical silver in bags like these, but also a great way to protect your bullion in the safe or vault. 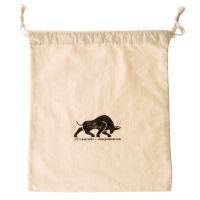 Bags are made with 100% cotton and are closeable with the drawstring at the top. Buy them today and protect your silver from dust and surface scratches!